Husky health problems are fortunately not very prevalent in this breed. They are generally all around healthy and will not require frequent visits to the vet. However, all Husky owners should be aware of the few genetic health issues that can affect this breed. 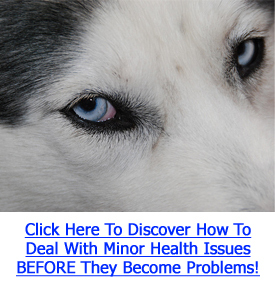 It is also important to ask your breeder if there has been a history of health problems in your Husky’s line. The two main types of Husky health problems are hip dysplasia and eye problems. Although hip dysplasia is present in Huskies, it occurs at a far lower incidence than in almost any other breed. Hip dysplasia is inherited genetically so it is important that your breeder screens for this issue in their lines. Although not detectable at birth, this issue becomes apparent within the first 2 years of age. Whether you are considering getting a Husky puppy or already own a Husky, it is important that you ask your breeder whether there has been any incidence of hip dysplasia in your Husky’s lines. Hip dysplasia is an abnormal development of the hip joint in young dogs. The ball and socket joint in the hip is unable to move or rotate as freely as it should be able to. The ligaments and soft tissue in the joint don’t develop properly and as a result, causes abnormal motion within the joint. This leads to pain and limping. Depending on the severity of the problem, it can prevent your Husky from performing normal functions and competing in dog shows. Click Here To Discover How To Eliminate Minor Health Issues BEFORE They’re Major Problems! The main Husky health problems of concern are eye problems. Eye problems are more common in Huskies than hip dysplasia. Although there are many eye problems that can affect dogs, only three eye problems are of concern in this breed: cataracts, corneal dystrophy, and progressive retinal atrophy. The rate of cataracts is relatively high in Huskies but in most cases, they do not affect the vision of your dog. There are more aggressive types of cataracts which can cause blindness but this form is much rarer than the typical form. Corneal dystrophy is another eye problem in Huskies. It’s usually not detected until the dog is at least 4 years of age. In its early stages, vision is not affected extensively. With proper evaluation and treatment, good vision can be restored. Progressive retinal atrophy is the more serious eye problem in this breed. It is genetically inherited, although the incidence is low. Eventually, it leads to blindness although it can be detected before there are any signs of blindness. Although Huskies do suffer from fewer health problems than most breeds, it is also important to be aware of the hereditary problems that can affect them. Selecting a good breeder is essential for this reason. Make sure your breeder screens for any of these Husky health problems to ensure that your Husky can live a healthier life.